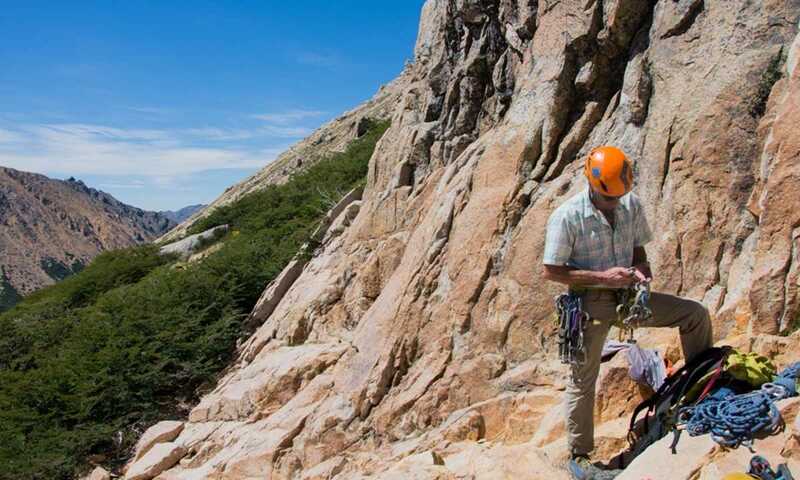 Having the chance to experience the best of Patagonian rock, following the good weather, this trip is for anyone who wants to experience a real rock climbing adventure. Starting with the Frey needles and making your way south to El Chalten, you will finish on a literal high, summiting an iconic Patagonian peak. Day 1 – Bariloche: Bariloche: We’ll meet at the airport and transfer to your hotel, where we’ll have an introduction to your trip and check our gear. Afterwards, we’ll go out for dinner. This cosy town by the lake offers both good restaurants and nightlife. Day 2 - Frey Approach: From downtown we drive to the foothills of Cerro Catedral, a world class ski resort. From here we pass by the Gutierrez Lake to get to the Van Titter creek and walk the last switchbacks to Refugio Frey, at 1770m above sea level. A porter will help us with the supplies for the next days. After getting there, we set up our tents and get the first glimpse of the area granite spires. Depending on how we feel, we might do some climbing in the evening. Days 3 and 4 - Climbing Frey: We spend the next two days in this rock paradise by the lake, choosing routes according to individual climbing skills and objectives. Here we’ll be able to climb single and multi-pitch routes from bolted faces to long cracks, always surrounded by the amazing Patagonian landscape. Day 5 – Frey to Bariloche: After our last session of climbing we hike down towards our car, in time to get to the hotel for a well deserved shower and a delicious dinner. Day 6 – Bariloche to Pampa Linda: We pick you up at your hotel and drive to Pampa Linda, check in with the park rangers and hike 4-5 hours to Meiling Hut at 1900m. In the evening we arrange our equipment, enjoy dinner at the hut and get ready for summit day. Day 7 - Tronador Summit: Early in the morning we start hiking on the glacier to take advantage of the firm frozen snow. Our first challenge will be to traverse the Filo de La Vieja, a sharp ridge that divides two glaciers. After a technical descent from the Filo, we keep traversing though crevasses and seracs until reaching the big plateau before the summit. From here the terrain gets steeper and the wind increases at the pass, so we change techniques to short roping, pitching and/or rope fixing to face the last challenging section that leads us to the summit of the Argentinean Peak. After spending some time on the top, we traverse back to the hut. Day 8 - Pampa Linda/El Bolson: We leave Meiling Hut after breakfast. We return through the moraines and forest to get back to Pampa Linda, where we have lunch before we drive to El Bolson, for dinner and lodging at a hotel. Days 9 and 10 - Piedra Parada: From El Bolson we drive to Piedra Parada, where our fingers need to be strong at this great crag in the Chubut desert. With a magic Patagonian landscape as our backdrop, we’ll get in shape, refine techniques and climb lots, before moving on to our next objective. Day 11 - El Chalten: Early in the morning we drive south to El Chalten, where we will arrive in the evening. During the ride we will witness the immense Patagonian steppe and its wildlife. Once in El Chalten we will have dinner and enjoy the comfort of our hotel. Day 12 - El Chalten: We take a deserved rest day in El Chalten, getting everything ready for our next goal. Day 13 - Piedra Negra Camp: We use the morning to rest and organize final details. Just after brunch we drive to the Rio Eléctrico bridge where we’ll start hiking towards Piedra del Fraile, and then through the steeper trails in the area, to reach our bivy site. After a good dinner, it’s early to bed and our focus is on the next peak. 4 to 5 hours hiking. Meals: Breakfast, Packed Lunch, Dinner. Day 14 - Aguja Guillaumet: Depending on personal preferences and conditions, we’ll choose between two classics: a mostly rock climbing route on the northwest face or a classic ice and snow couloir on the Amy Route. Both routes are fantastic, and it will be the perfect finale for this alpine trip. 10 to 12 hours hiking. Day 15 - El Chalten: We break camp and get back to El Chalten for our last night together, which we celebrate with a traditional “gaucho’s asado” (Cowboy’s BBQ). Day 16 - Extra Day: We’ll use this as a back-up day for weather and other considerations. Day 17 - El Calafate/Bariloche: Drive to El Calafate airport for your flight home or back to Bariloche. The price of the trip is $8800 USD per person for a group size of 1, and $5100 for a group size of 2. This trip can run as a group trip, with prices starting from $5,100 per person for a complete group. If you are looking to join a group or you are a solo traveller we will help to form likeminded groups of travellers. Please let us know your travel plans.